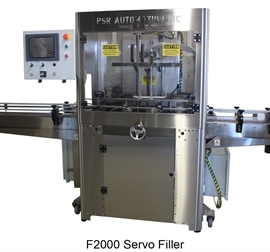 The PSR Automation Inc. F2000 Servo Filler handles bottles in the 2 oz to 2.5-gallon range, Product is metered by Individual Servo Controlled Stainless Steel Positive Displacement Lobe Pumps which can handle products from water thin to thick gels. 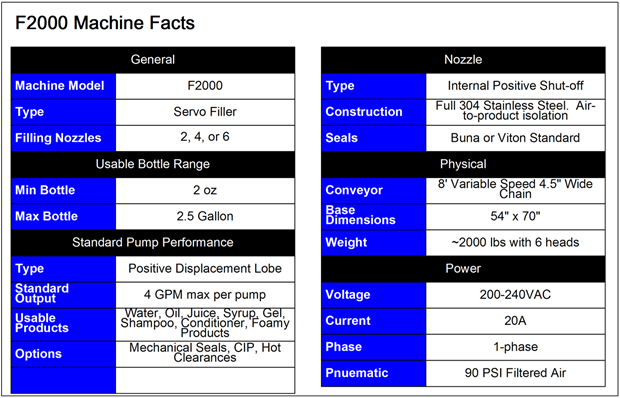 Optional upgrades can allow the filling of grease or heated products. Construction is primarily 304 Stainless and Aluminum, with all product contact part made of Stainless.